We all know how much music can enhance the atmosphere in a movie. Well, the same works for Halloween. It is definitely sure to add to the mood of the spookiest night of the year, if you have selected the right Halloween music. For entertaining the younger kids you might want to use slightly spooky Halloween music like the "Monster Mash", "Purple People Eater", the "Addams Family" or "Ghostbusters". To scary older adult you might use scary music like "Thriller", "The Phantom of the Opera" or "Funeral March of a Marionette"
Bigasoft has collected much free and spooky Halloween music for you to free download. Download the free and scariest Halloween music here. Is it possible to set the free downloaded Halloween music as iPhone/ iPhone 5S/iPhone 5C/iPhone 5/ iPhone 4S/ iPhone 4/ BlackBerry Q10/ BlackBerry Curve Halloween ringtones for free? Yes, Bigasoft can help you to achieve it with its Bigasoft iPhone Ringtone Maker and Bigasoft BlackBerry Ringtone Maker. Just imagine how your friends or family will be when they heard the scariest Halloween ringtone when your phone rings on Halloween night. It is really economical and practical to download this powerful ringtone maker whether to make Halloween ringtone for iPhone/iPhone 5S/iPhone 5C/iPhone 5/ iPhone 4S/ iPhone 4/ BlackBerry Q10/ BlackBerry Curve. It is also a good idea to send this professional ringtone maker as a gift to your friends or family. Bigasoft has designed a professional iPhone ringtone maker (for Windows, for Mac) which helps you to make free iPhone Halloween ringtones. 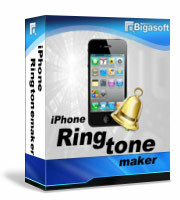 Bigasoft iPhone Ringtone Maker is a powerful iPhone ringtone maker which helps you easily rip music like MP3, WMA, APE, WAV, and M4A to iPhone ringtone M4R, and transfer the new created ringtone to iPhone via USB cable for you automatically. The ideal Bigasoft iPhone Ringtone Maker even can extract audio from video and then rip the extracted audio as iPhone ringtone. With it, just make ringtones from your scariest Halloween music/movie to Halloween iPhone ringtone. Bigasoft helps you to make BlackBerry Halloween ringtone for free by via of Bigasoft BlackBerry Ringtone Maker. 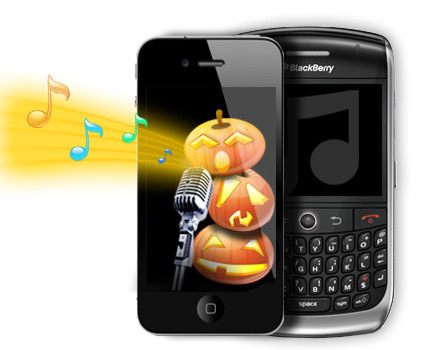 Bigasoft BlackBerry Ringtone Maker is designed to create free BlackBerry Halloween ringtone. The powerful BlackBerry Ringtone Maker (for Windows, for Mac )can convert whatever music or movie including MP3, WMA, WAV, RA, M4A, AVI, MPEG, WMV, DivX, MP4, H.264/AVC, AVCHD, MKV, RM, MOV, XviD, 3GP, WebM, VP8 to BlackBerry ringtones MP3. It is totally free when you create iPhone/Blackberry ringtone no longer than 10 seconds with Bigasoft iPhone Ringtone Maker or Bigasoft BlackBerry Ringtone Maker. If you want to create iPhone/Blackberry ringtone much longer than 10 seconds or even much longer than 40 seconds, then you only need $14.95 for Bigasoft iPhone Ringtone Maker and $9.95 for Bigasoft BlackBerry Ringtone Maker. Just free download the powerful ringtone maker to make thousands of free and spooky Halloween ringtones for your iPhone or BlackBerry.